The Nonconforming Materials (NCM) module from Grand Avenue Software automates and streamlines the steps involved in identifying, tagging, quarantining, dispositioning, tracking and trending material moving through the organization that does not meet the appropriate specifications. This single solution addresses nonconformances across your material flow including suppliers, receiving inspection, all stages of work in process, the various materials stores, and field locations. Data is gathered in an easy-to-use, easy-to-enter environment. This information flows through a compliant NCM process to ensure that the necessary approvals and reviews are provided. As this happens, data about nonconformances such as location, quantity, reason for nonconformance and disposition are transformed into valuable business intelligence. Real time status is constantly available profiling individual nonconformances, nonconformance trouble spots, potential supplier issues and NCM trends. This intelligence leads to quicker identifications of problems, better focus on the most detrimental offenses and a significant reduction in the overall cost of nonconformances for your organization. 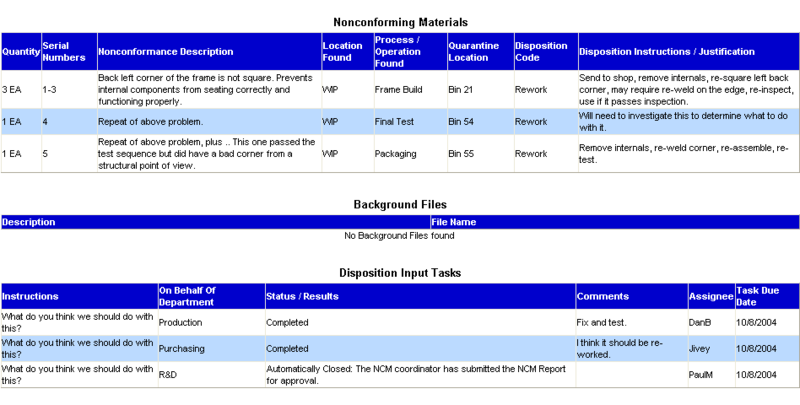 The screen capture of the NCM application shows a nonconformance report being created and submitted into the system. The upper section under the heading Nonconforming Materials shows three distinct line items entered on this particular report. These three line items represent different samples of the part that have been found to be nonconforming at three different locations of work-in-process (frame build, final test, and packaging). The lower table in the screen capture under the heading Disposition Input Tasks highlights functionality to help determine the appropriate disposition for nonconforming materials. In some cases, input is needed from a variety of people to determine the proper disposition for materials. The software supports the gathering of input from a variety of sources in a collaborative manner. This results in efficient disposition of material and effective sign-offs by material review boards (MRB).